» Forum » Restoration » Restoration questions » Best way to install new metal posts in new plastic set? » Best way to install new metal posts in new plastic set? Best way to install new metal posts in new plastic set? What is the best way to install new metal posts on brand new replacement plastics? I'm working on EBD and have a new plastic set. I was able to remove the existing metal post by heating the post with a soldering iron until the plastic just got a bit soft to remove the metal post. Pictures might help on this one. If I understand what you are describing, I had the same challenge with my Black Knight, metal posts that are basically riveted into your plastics. I got that from the heating up comment. Once removed it is recommended that you file the metal post to level and you could then reuse the metal and just let it sit in the new plastic hole. I tried this, but in most cases I did not like the fit. I might have used a few posts this way. For the majority of those posts I replaced the metal entirely with custom cut rubber post sleeves, picture example attached. If its only the metal "bell" that's in the plastic, then heat up only the bell and reverse the process back into the new plastics. 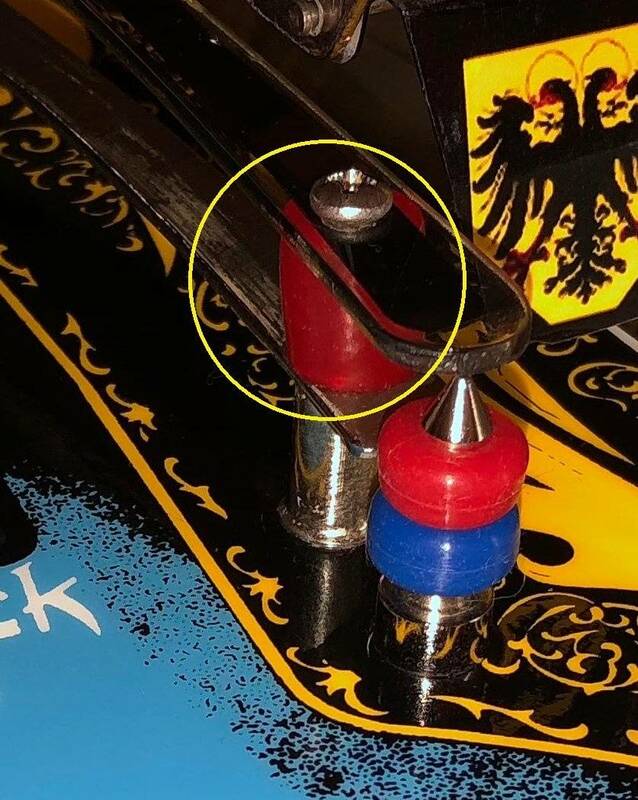 I did this with a very large plastic for my F2K, and it has several metal bells, I just turned the plastic art side down and heated up the bell and pushed it back into the new plastic that was flat on a table. Heat up the inside of the top of the bell (narrow side) inserting the hot soldering iron from the bottom (wide side). Do this by touching one spot for three seconds, then keep moving around the inside of the bell, maybe two laps around. Then place the bell on a flat surface and push the plastic down firmly. It should slowly slide in. If it doesn’t heat the bell some more. I have a slightly different question: I have new plastics but I am not sure how to get these front-facing ones installed since the originals are riveted into metal L brackets. Looks like I will need find a source for new rivets for the new plastics. Has anyone ever done this, or do you have an idea of how to change these out? You should be able to use a drill bit from the backside to drill out rivet where it is folded over the metal bracket and pop the remainder of the rivet through the front of the plastic. You will need a rivet press to re-install the metal bracket to the new plastic. If you don't have a rivet press, you could use a screw and nut to re-attach the bracket and plastic, but it doesn't look as nice. Can you by the metal "bell" posts anywhere?